The Matias Family: My Learning Adventure! I am excited because I am about to do something totally different! I am going on a learning adventure! Starting next Monday, I am going to take a break from helping Felipe in the leadership of the Lighthouse Community Center and begin a 3 month long Youth With A Mission training school called the Foundations of Community Development school. WHAT is the Foundations in Community Development SCHOOL? 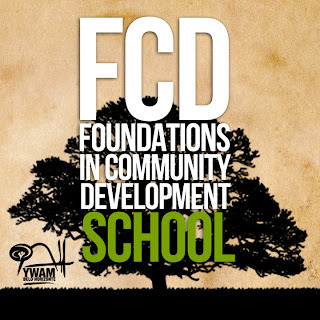 The Foundations in Community Development school or (FCD school) is a a course that trains people to work in poor communities, based on values and principles found in the Word of God. This course equips students with skills to help communities initiate and accomplish strategic activities that will bring life and growth towards God's purposes in His kingdom on earth. To read more about this training school click here. I will go to class for half the day and the other part of the day I will be with my precious daughter, Sophia. Felipe and Sophia will have lots of daddy-daughter time during this season, as Felipe will be caring for Sophia when I am in class. She luckily still has two naps a day so that will help us out a bit because Sophia will be sleeping while Felipe is able to do some work things. Please pray for me as I am concerned about the work load. I hope I will be able to manage my time well and balance it all - going to classes, reading required books, completing required written assignments, and all the while being a good wife and mother. I strongly feel God has challenged me to do this training course and I know HE has an awesome purpose in this. God has shown me that He desires that I GROW in Him and in my knowledge of how to reach people living in poor communities. I sense that He will reveal more of HIS heart and better equipe me for the future work He has for me. I know God has called us, the Matias family, to work long-term in missions with children at risk living in poor communities. I am open to hear God share with me how we (as a family) can better serve Him and reach the needy. I am expectant about this learning adventure I am about to embark on!